Also, there is a very complete Historcal web site of the town of Columbus, Indiana. 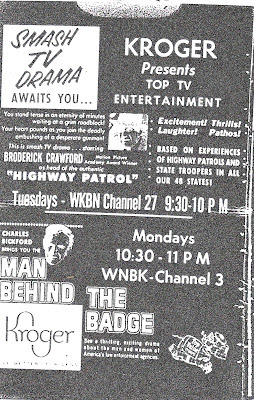 Part of this site is a page titled "What We Watched on Television:In shades of Black and White"..A long, nostalgic article detailing 1950's and 60's television watching in Columbus, Indiana, near Indianapolis, loaded with TV Guide listings and ads of the period..Very well done. 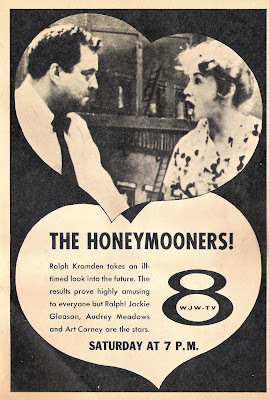 The rest of the site seems quite interesting as well..
From YouTube member CatWithNoName, Steve Allen comments to the audience..from the first week of the "Tonight" Show in 1954..Interesting is his comment near the end..Basically saying that if "Tonight" is as successful as "Today" and "Home" (Arlene Francis), NBC will come up with "Son of Tonight", which eventually happened with "Tomorrow" and other shows in the post-Tonight time slot..
TV Guide Ad from about 1955 showing Kroger sponsorship of two different syndicated shows-Highway Patrol and Man Behind The Badge. While Kroger is now the largest grocery chain in the United States.."The Grocery Wars" have kept them from operating Stores under the Kroger name in NorthEast Ohio since the 1980's, Though they do supply Food 4 Less stores..
Just a note to let you all know of a new permanent link to our blog-J. Alan Wall's TV signoffs pages..More information on the site is in the previous post below..Also:If anyone has a suggestion for new links, It would be much appreciated..Feel free to e-mail me or use the Blogger "comments" feature. 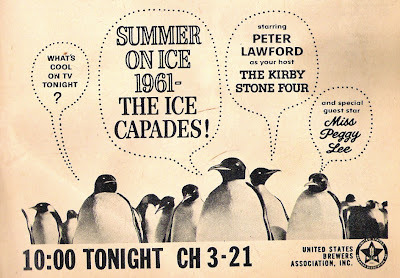 While they can be about Local Classic TV/Radio They cas also be about Nostalgic TV and radio on a national level, or just good TV/Radio news sites. 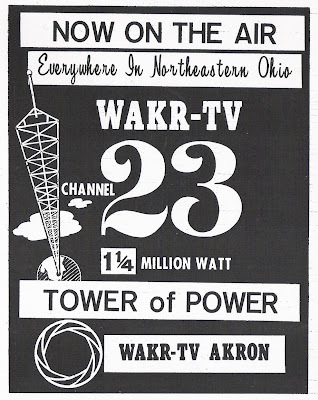 I am currently working on an article on the First days of WAKR-TV 49 and may go to Cleveland in the next week or so to gather more material for future posts, including possibly some early WEWS and WNBK (WKYC) Newspaper articles about their first days on the air..Particularly a Large Cleveland Press supplement book on WEWS-TV..I know I've been a bit slow on posting lately, but I hope to pick things up more as whe head toward the blog's first anniversary around the end of March.. The Internet, Cable and Satellite has spawned interest of things in media that no one thought would be of that much importance..YouTube has hundreds of TV commercials from as far back as the late 1940's..A whole hobby has grown up around such mundane things as TV Test Patterns, network logos, and Television sign-on and sign-offs..
J. Alan Wall has a website dedicated to TV station sign-offs (and a few sign-ons).Most of these of course are video.Mostly from his home area in the Southern US from the 1980's-2000's..
A friend of Wall's, Jerry Immel, a voiceover artist from Atlanta, has shared a number of MP3 clips (audio clips only, unfortunately) from watching TV in Cleveland and Philadelphia in the mid-late 1950's..These may be the only clips out there of some of these voices..
"We're gonna blow our own horn..
Corny isnt it?.But fun though..
WVUE-12 Wilimgton, Delaware (Phila.) Storer owned this station for a time before foolishly letting it go. 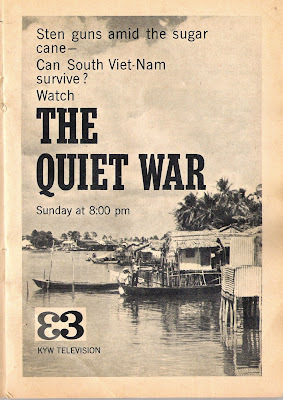 TV Guide Ad for an early News Special on South Vietnam shown on KYW-TV 3-This was part of a monthly Internationally produced series called "Intertel"..Presumably on the Westinghouse stations, though it may have been shown in other countries as well. 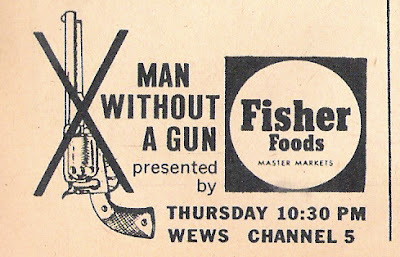 This was an example of Westinghouse airing interesting, thought provoking shows and specials in Prime Time. 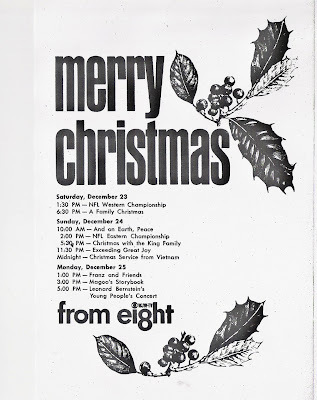 Pre-empted "National Velvet" and "Tab Hunter"
Of course, history showed that South Vietnam did not survive..
WJW-8 had a live wrestling show from Cleveland at 5PM Saturday, June 3..
TV 8 was in its first of 19 straight years of Cleveland Indians Baseball telecasts..Ken Coleman and Harry Jones were the announcers. The Movie Show, "Ernie's Place" was featured Monday-Friday 9:30-11AM on WJW-TV 8-"Ernie" being Ernie Anderson of later "Ghoulardi" Fame alog with "Director" Tim Conway, just a short time before his move to Hollywood and "McHale's Navy" fame..
Jack Paar was being shown on WEWS-TV 5 at 11:15 Monday-Friday-The only regular color show on TV 5's schedule..
Doug Adair had "City Report" at 11:10 most nights, following Warren Guthrie's "Sohio Reporter"
KYW-1100 DJ "Big" Wilson, In addition to hosting early evening weather, was the 1:00 PM movie host at Channel 3. 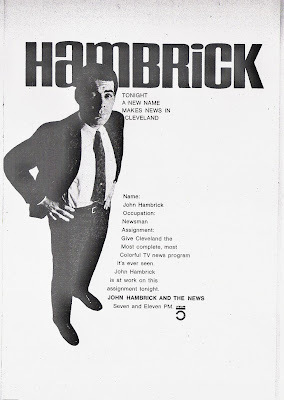 Just wanted to share a couple things this morning..Our most recent post on John Hambrick drew the biggest single day response from readers in the history of the Cleveland Classic Media Blog..We use an application called sitemeter.com to count the number of users that come through the blog on any given day. The general average is 60-90 visits per day with over 100 whenever I post something new. We have hit 136 twice..The Hambrick story was posted Monday at 3:15 PM and had the usual spike of page visitors resulting in a final Monday total of 130..A really good day but nothing that unusual, being that something new had just been posted. A site called TVSpy.com, a clearinghouse for information of use to TV professionals, especially news anchors and reporters, noticed the John Hambrick Debut story and featured it Tuesday morning on its website. I first noticed something unusual when 28 visitors showed up between 9-10 AM EST..I usually average 0-9 visitors for any one hour with a previous high total of 18...It was only the beginning. There were two hours of 31 and one hour of 34 visitors in the afternoon..An Average of 13 throughout the 24 hour day ending Midnight Wednesday and a total viewership of 317 throughout Tuesday. I was floored by the response, and much of it was due to the TVSpy Article. As of 5:30 This morning, there are 18 more visitors..Unusual for the overnight hours. TVSpy.com also has the latest Happenings in the TV News industry and forums for TV personnel..Its basic service is free but there is a Gold membership that they charge for. I am adding a link to TVSpy.com to the set of blog links as of this morning..Looks rather interesting..Thanks also to our regular readers for helping us have our biggest day ever..